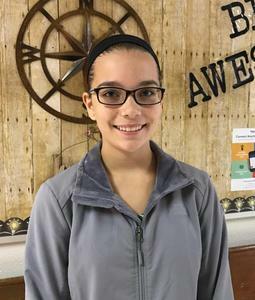 The Avalon Middle School spotlight shines bright on 8th grade student, Paige Jacks! Paige enjoys her math class the most as that is her best subject. She enjoys pop music and her favorites include pepperoni pizza, the color yellow and the TV show, Riverdale. Her favorite activity outside of school is training dogs. Paige plans to go to college to become a mechanical engineer. That is her career aspiration along with training dogs. Paige says, "This year has been going by very fast! It seems really easy and drama free. The school is very energetic and our sports are super fun!. The teachers are really nice, too." Her favorite saying - "Always be yourself."